Many modelers inquire about available plastic models appropriate for Pre-Depression era model railroads. The general perception among a large number of hobbyists is uninformed and many feel there are only a few models appropriate to represent railroads of the 1920s. With the help of several railroad prototype modelers, this guide has been assembled to illustrate the possibilities of a 1920s freight car fleet using HO scale plastic models. As of this February 2018 update, these are currently available (or anticipated) HO scale, injection molded plastic products appropriate for a 1920s modeling focus. Not all of these products display the appropriate paint or lettering to reflect a 1920s prototype freight car. Reference detail is included on several models to encourage the reader to seek out published articles featuring additional prototype details. Many of the Railmodel Journal articles noted through this survey are currently available to view on the TrainLife website. The search function is easy to use in finding the specific issues. Several Railroad Prototype Cyclopedia volumes are highly recommended, but not all are readily available. Check the hobby shops listed on the publisher website to track down a copy. Many images featured here are of HO scale model freight cars from the collections of other Pre-Depression era modelers and may have had detail parts and weathering added in the building process. A guide of this nature has many contributors and folks who review the facts before it is posted here. Many thanks to the Pirate Crew of Pre-Depression Era railroad modelers: David Bott, Ray Breyer, Dave Campbell, Kyle Coble, Steve Hedlund, David Jobe, Sr., Richard Kowalski, Dan Merkel, Harold Oakhill, Dave Parker, Dean Payne, and Mark Plank. A number of 36-foot box car kits were introduced in 2017 and 2018. These models came with KC brake systems and Andrews trucks. Links to prototype summaries can be found on this blog page to help you understand a variety of prototypes. 2400 and 2500 Series USRA 55-ton twin hopper – 25,000 prototypes built under USRA control from 1919 to 1920 and assigned to 23 different railroads. The 2400 Series hopper models are supposed to be decorated with USRA “as built” lettering schemes and are packed with Andrews trucks. The 2500 Series models carry later lettering styles and are packed with ARA cast steel side frame trucks, commonly called “Bettendorf”. 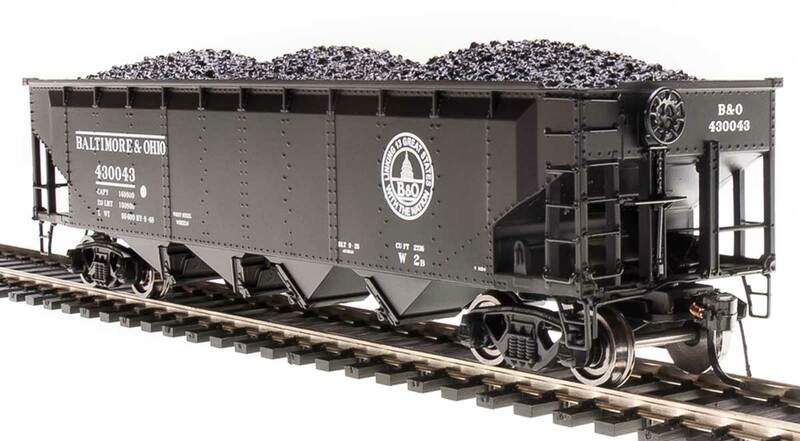 2700 Series 55-ton wood side twin hoppers – These models closely match a series of Nickel Plate Road hoppers built in the early 1920s. 4600 Series USRA 40-ton double-sheathed box car – 25,000 prototypes built under USRA control from 1919 to 1920 and assigned to 24 different railroads. Several models in this 4600 Series are decorated with “as-built” lettering styles. Compare prototype images with the product images on the Accurail website to ensure a model with lettering for your era. All of the 4600 Series models are packed with Andrews trucks. A data only version of this model is also available with lettering following the original data arrangement. Also see Railroad Prototype Cyclopedia Vol. 16 for more prototype details. Mostly similar to Canadian National and Grand Trunk Western prototypes built just before and after WW1. Consult the article for additional prototype details. A simple upgrade can be done by installing some strip styrene to make a straight steel centersill. This change can make these models better reflect some prototypes. One or two additional modifications and the model would resemble a series of 3700 Atlantic Coast Line cars. While the 4100, 4300, and 4500 series models are reflective of several prototypes built in the 1920s, these are NOT USRA design box cars. 4800 Series 40-foot wood refrigerator car – very similar to cars installed by the FGE Companies in 1925 and 1926. These models hold similarities to Illinois Central and Milwaukee prototypes, but are a bit too tall to match specific freight cars. Not all Accurail paint and lettering schemes are proper for a 1920s era freight car. Several Accurail products do have paint and lettering accurate for the 1920s and early 1930s time period. I recommend comparing the products with prototype images. Brake systems on nearly all of these Accurail models will need to be backdated by installing a KC or KD system. 30-foot flat car – The model is mostly similar to a Milwaukee Road prototype built in the early 1940s for special hauling of naval gun barrels and heavy loads.. It bears passing resemblance to a Pennsylvania Railroad prototype. 40-foot Pflauder milk car – Don Valentine sent along additional prototype details: The “40-foot Pflauder milk car” shown in this list is a GPEX car by acquisition only. It is in fact a model of an MDT constructed car, many of which were later acquired and operated under lease by General American – Pfaudler Corp. just as their own General American constructed cars were. These cars from the Athearn “Roundhouse” line are, however, accurate to model from the mid-1920′s on into the early 1950′s. 50-foot single-sheathed automobile box car – Follows Texas & Pacific and Western Pacific prototype cars. See Railroad Prototype Cyclopedia Vols. 5 and 14 for more prototype details. Not all Athearn/Roundhouse paint and lettering schemes are proper for a 1920s era freight car. Brake systems on nearly all of these Athearn/Roundhouse models will need to be backdated by installing a KC or KD system. This truss-rod, double wood-sheathed, refrigerator car is a model many model railroaders believe is appropriate to use if modeling the 1920s or 1930s. A similar box car and stock car has also been available. After reviewing many prototype photographic images taken in the 1920s, I feel these Athearn/Roundhouse 36-foot box, reefer and stock car models are more appropriate for an earlier 1905-1920 era with the truss rods and wood roofs. With some alterations and modifications, these freight cars can be used for the 1920 era, but it may be easier to scratch build the same model. This model was a former Branchline Trains product. Several Atlas products do have paint and lettering accurate for the 1920s and early 1930s time period. I recommend comparing the products with prototype images. GLa 2-Bay Hopper – Thousands built for the PRR and many near copies built for other railroads. This model can be used as a stand-in for those railroads with fleets of the 1905 Common Design hopper. H21 Clam Shell 4-bay hopper – Thousands were built for Pennsylvania Railroad service. The Baltimore & Ohio Railroad had a few thousand very similar hoppers in their W-1 class. H22 Clam Shell 4-Bay Hopper – Often used in captive service between coke operations and steel mills. These were being rebuilt into H-22a cars through the 1920s. H22a 4-Bay Hopper – rebuilt H22 cars. GS Gondola – Thousands built for PRR and subsidiaries and used to haul a variety of loads. Several Bowser products do have paint and lettering accurate for the 1920s and early 1930s time period. I recommend comparing the products with prototype images. Brake systems on nearly all of these Bowser models will need to be backdated by installing a KC or KD system. Image from the BLI website. ARA standard 70-ton quadruple hopper – This recent BLI release is of generally good overall quality. It has KD brakes, and the 6-spring, 70-t Symington trucks are unique (but only appropriate for some roads). The side-sheathing details are slightly different than the MTH car that is noted further down this page, and may work better for certain roads. The BLI model seems to reflect the revised car design introduced in 1929, while the MTH model follows the original ARA design of 1926. The model represents an upgrade over the old Athearn/AHM/Bachmann patterns. They certainly offer kit-bashing opportunities for folks who want to upgrade the details. Backdating the lettering and reweigh dates will be needed in almost all instances to create an accurate 1920s model. Modelers are advised to seek out Ed Hawkins’ definitive article on the ARA quad hoppers published in Railway Prototype Cyclopedia, Volume 5. This article and photos of specific prototypes can guide a modeler to the specific structural details and lettering. Initial releases of the product reflect a prototype that was upgraded in the late 1940s with new hardware. We hope BLI produces a version that more closely follows the original design that was first produced in the early 1920s. USRA Composite 50 ton Drop Bottom Gondola – 20,000 prototypes built under USRA control from 1919 to 1920 and assigned to 25 different railroads. AT&SF Caswell Gondola – Several classes have been available representing a few thousand in-service cars. AT&SF SK stock car – Several classes have been available, but only the K brake equipped SK-R is accurate for the time period. Intermountain has labeled some of their products as to the era represented by details, paint, and lettering. I recommend comparing the products with prototype images. USRA 55 ton twin hopper – This model is a very good casting with scale wire grab irons and handholds, and comes equipped with a split KD brake system. The Andrews trucks are also excellent. Unfortunately, only some of the railroads offered by MTH actually had USRA hoppers with the road numbers provided (e.g., PRR, B&O, P&LE). Other hoppers are misnumbered or, more commonly, are lettered for railroads that had 50-ton steel twin hoppers similar to the USRA design but were not. The Erie car pictured here is an example of a railroad that did not have USRA design hoppers. Oddly, catalog photos show the typical lever-style hand brakes, but three models seen “in the flesh” have vertical-shaft hand brake wheels. The models all have Enterprise door locks, which seem to be appropriate for many USRA hoppers throughout the decade. As with many of the models noted here, modelers are advised to seek out photos of specific prototypes to guide detail and lettering. ARA standard 70-ton quadruple hopper – The ARA standard 70-ton quadruple hopper came into use in 1926 with 3000 cars delivered to the B&O, and another 2000 cars to the B&O in 1927. This Southern Pacific car offered by MTH is part of their RTR freight car products, although the SP did not own any cars of this design. It is a decent model, but not nearly as nice as the 55-ton USRA twin noted above. The brake hardware is not very detailed, but it looks like KD. It would likely work for some roads. At first glance, these cars are similar to the BLI ARA quad hoppers noted near the top of this list. Some modelers have noted subtle differences in the side sheathing, doubler plates, end panel taper, ladders, hand brakes, and trucks. This MTH model seems to reflect the original 1926 design while the BLI model follows the revised design introduced in 1929. Overall, this model also represents an upgrade over the old Athearn/AHM/Bachmann patterns. They certainly offer kit-bashing opportunities for folks who want to upgrade the details. Backdating the lettering and reweigh dates will be needed in almost all instances to create an accurate 1920s model. Image from the MTH website. This model seems quite accurate structurally and paint wise. The black roof is correct. The build date of 1928 is correct, as is the pre-1933 UP herald and a correct road number. The model purchased for the review has a KC brake system and has no obvious later reweigh date. It seems to be a very good late-1920s rendition that complements the Red Caboose R30-12 nicely. The only noticeable glitch are the otherwise excellent T-Section Bettendorf trucks, which were not applied to this particular PFE reefer class. Prototype R40-2 cars were delivered with ARA Type Y Cast Steel Frame trucks. Any 1920s modeler will happily install these sweet T-Section Bettendorf trucks on another model. I wish they were available separately. One of the kits will cover three Southern Pacific flat car classes in the post-Harriman era. Additional flat car models are coming soon! UTLX Frameless Tank Car – 6500 gallon tank cars originally built between 1908 and 1912. Image from Rapido Trains website. 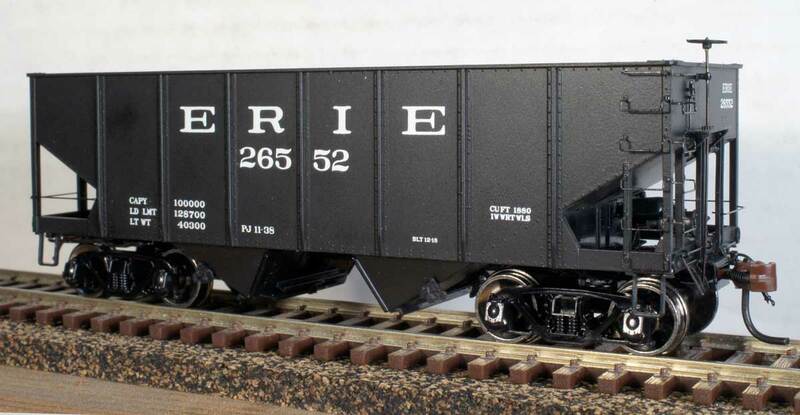 Northern Pacific double-sheathed box car – Rapido announced this model in the summer of 2015. The prototype box cars were built in 1923 for the Northern Pacific. 3994 are listed in service in the 1926 ORER in the 10000-13999 car series, and 3943 cars are listed in the 1943 ORER. The Red Caboose line of models has been sold to Intermountain and can be found advertised and marked under that brand. Not all of these Red Caboose models will be released through Intermountain. Keep your eyes open at train shows for these fine models. X29 and ARA 1923 Proposed Standard Steel Sheathed box car – Thousands of the prototype box cars were built for PRR and B&O. Slight variations in prototypes were made available with individual model versions. See Railroad Prototype Cyclopedia Vols. 18 & 24 for more prototype details. R-30-12 Reefer – Mostly follows a PFE prototype class. Red Caboose had also produced models of a 37-foot wood-sheathed, Mather refrigerator car but these models have not been produced since 2009 or 2010. A summary of this model can be found in a DesignBuildOp blog post. This Tangent Models 6000 gallon, Three Compartment tank car is an exceptionally well done model that falls into a grey area on our summary here because only two prototype owners received cars that fit the parameters of this list: COSX (1929) and STCX (1930). The lettering all conforms to the build date (i.e., no later pressure test dates). The models come with AB brake systems installed and would need to be backdated to K brake system hardware for a proper appearance through the late 1930s. Of minor concern are the trucks. Tangent has installed lovely 50-ton, 5-spring trucks, but this car might look better on a pair of Tahoe Model Works ARA 40-ton trucks (TMW-215). USRA 50 ton single-sheathed box car – 25,000 prototypes built under USRA control from 1919 to 1920 and assigned to 22 different railroads. See Railroad Prototype Cyclopedia Vol. 17 for more prototype details. USRA 55 ton twin hopper – 25,000 prototypes built under USRA control from 1919 to 1920 and assigned to 23 different railroads. Fishbelly centersill flat car – Follows an NC&StL prototype and is close to several prototypes that ran on the DL&W, SP&S, Cotton Belt, Canadian National, Canadian Pacific, and New York Central Lines. Tichy R30-13 Reefer – Mostly follows a PFE prototype class and can be use for R40-2, R40-4 and R40-8 classes with some modifications. Low Side Gondola – Follows an Atlantic Coast Line prototype. If this model is built without the gondola sides, it closely resembles some flat cars built for the Akron, Canton & Youngstown, Chesapeake & Ohio, and the Denver & Rio Grande Western. Image from the True Line Trains website. Canadian Pacific Minibox – A steel sheathed box car introduced in June 1929. 7,500 were built over the next year. 36-foot Fowler/Dominion box car – Between 1910-1915, 33,000 box cars of this design were built for the Canadian Pacific. Another 40,000 box cars of a similar design were built for Canadian National, Grand Trunk and a handful of US railroads. 36-foot Fowler/Dominion stock car – Beginning in 1919, more than 5,000 of the Fowler design box cars were converted to stock cars for Canadian Pacific and Canadian National. These Fowler/Dominion box and stock car models were announced in early 2013 and have not yet hit the market as of this update. We do hope they arrive soon. These are among some of the finest tank car models available. These cars have been produced with a couple of different size tanks, as well as the insulated tank version in the image above. Not all Walthers Proto paint and lettering schemes are proper for a 1920s era freight car. Brake systems on nearly all of these Walthers Proto models will need to be backdated by installing a KC or KD system. Some of these tank car models were produced with the older KC or KD brake systems. Each of the following articles contain a wealth of prototype details. Walthers Proto has issued some versions of their AC&F Type 21 tank car model that are appropriate for the 1920s as they are equipped with KC brakes, and 1920s build and maintenance dates. The production runs were low, but these Walthers Proto models do exist, possibly even in the original LifeLike Proto2000 boxes. The photo of the Shell car above has had the original trucks replaced with more appropriate Tahoe Model Works ARA 40-ton trucks (TMW-215). Arch bars were quite common on Type 21 tank cars throughout the decade and at least a few cars rode on T-Section Bettendorf trucks. USRA Drop End 70 ton Mill Gondola – 5,000 prototypes built under USRA control from 1919 to 1920 and assigned to 5 different railroads. Walthers also lists the X29 Box Car, a stock car, and a XM-1 single sheathed box in their line. These are former Trains-Miniature products and resemble freight car designs used in the 1920s, but modifications and detail work will need to be done so they reflect a prototype better. Intermountain also offers some of the Tichy models as painted and lettered, ready-to-run products. A guide of this nature has many contributors and folks who review the facts before it is posted here. Many thanks to a veritable Pirate Crew of Pre-Depression Era railroad modelers: David Bott, Ray Breyer, Dave Campbell, Kyle Coble, Steve Hedlund, David Jobe, Sr., Richard Kowalski, Dan Merkel, Harold Oakhill, Dave Parker, Dean Payne, and Mark Plank. Thanks also to Ben Hom, Steve Sandifer, Dennis Storzek, and Don Valentine for additional discussions, tips, and suggestions that have moved this freight car guide to reality. This page was originally published in late 2012 and updated on February 21, 2018. Products come and go from the market leaving modelers to search out items at train shows and swap meets. A handful of appropriate models are possibly missing from this list. Additions are welcome but please keep them as currently available injection molded plastic models that need little bashing or work to reflect a pre-1930 prototype freight car design. Please leave a comment below. All comments are reviewed and approved before they appear here. The “40-foot Pflauder milk car” shown in this list is a GPEX car by acquisition only. It is in fact a model of an MDT constructed car, many of which were later acquired and operated under lease by General American – Pfaudler Corp. just as their own General American constructed cars were. These cars from the Athearn “Roundhouse” line are, however, accurate to model from the mid-1920’s on into the early 1950’s. I just got back from my trip to Wheeling, WV and Baltimore and Roanoke yesterday. Saw lots of things in two museums and several layouts. I spent some time on the actual area you are modeling and took some photos of the old Pennsy station foundation just north of the long gone B&O freight house you are modeling. I also took some photos of the plaques in the area as well as several photos of the locations where the tracks crossed the creek and ran to the various buildings. The rails are still visible to the entrance of one of the buildings and in the civic center parking lot from one of the bridges to the point they crossed main and 16th street. I’ll post pictures after I upload them and send you some via your blog that you might be interested in. I also took photos of all the remaining bridge structures crossing from the old grocery district to the freight house and station areas. It is amazing how much the place has changed. Really nice models Eric. I also took lots of pictures at the B&O museum in Baltimore. Got some shots of a few cars that might be suitable for your era. When I get the chance I try and send some to you. No Brad, it is not a USRA box car design. That Accurail model does not reflect an Erie prototype. It comes close to the Fowler/Dominion car designs the Erie rostered, but those were 36-foot cars, not 40-foot. Scroll down to the Tichy models to see a USRA single sheathed box car. The Erie was assigned only 200 of those cars by the USRA. The Accurail car represents a CN 40′ auto boxcar that was a stretched version of the Dominion car, it actually originated in a resin kit tooled by one of the Accurail founders prior to Accruail’s existence. It’s not accurate for anything other than that specific prototype, which was only built in small numbers. I really beg to differ, as I’m sitting here looking at a copy of a flyer published by Canadian Car & Foundry Co. Ltd. that illustrates the 750 boxcars of this design built for the CNR in 1923. As I recall, there were several other lots of similar cars built by several builders. At the time we were doing the tooling, I was led to believe by Stafford Swain that this was the standard boxcar for the road after they stopped buying 36′ cars and before they started buying the cars with six panel sides and Dreadnaught ends. The story about the automobile cars pertains to our 4300 series kits, the same car with corrugated steel ends. The CNR did not have any of these boxcars with steel ends as built, but did have a series of automobile cars of substantially the same dimensions. These were later rebuilt as single door boxcars, but closer to the WWII era, which is what that kit models. This just in, though it may be more craftsman kit akin to resin than a plastic model, while technically plastic. Hart Gondola with accurate detail, and, in two orientations. I noticed that you had a picture of the Red Caboose 42′ fishbelly flat car. I have been trying to find a prototype pic of this car, preferrrably the Rock Island flavored. I looked on a website, I don’t remember whose, and the ONLY pic of a Rock Island 42′ flat car was of MY model. No prototype, or any other car. HALLLLLLP! ! ! ! ! ! ! This article is terrific. Has anyone done this for N Scale? Now that I finally have my Tonopah and Tidewater RR in operational shape, I’m starting to pay closer attention to detail and accuracy with my rolling stock. As your blog demonstrates is that there is clearly a fair amount of kits and models available for the eras that we are interested in, however what is striking to me is the paucity of western railroads represented. With few exceptions there is very little available for UP, SP, WP, ATSF let alone SP,LA&SL, LA&SL or or D& SL. Did the USRA leave the western roads alone or were they uninterested in the designs? I know coal was being burned in Goldfield and it probably came from a western coal mine, but I can find a hopper lettered for a western road for this time era. Your thoughts?. Hey Nevin! Thanks for your comment. Your observations on the USRA freight car assignments are interesting. You are correct that those roads you mentioned received very few USRA car assignments. I believe the USRA initially allotted the freight cars based upon the health of the individual railroad freight car fleet and the war demands of the industries each railroad served. The Western roads you mentioned many not have had the need to update their fleets as much as other Eastern and Midwestern lines. Note the AT&SF and the SP each were assigned a few thousand USRA freight cars. Western lines seemed to prefer gondolas in that era as well, so few hoppers were assigned to western roads. The AT&SF Caswell gondola fleet was used to move quite a bit of coal. Note the El Paso & Southwestern were assigned 250 USRA drop bottom gondolas, which were probably put to use hauling coal from the mines in Dawson, NM. The Southern Pacific gondola book would be a solid resource to better understand their overall fleet. The union Pacific fleet would have similarities as both were under Harriman control until about 1910. I’m thinking about sliding up towards 1918 or 1920. In 1915 the Bullfrog Goldfield in Goldfield was controlled by the Las Vegas & Tonopah and they ran it as one company. In 1918 the USRA kicked the Las Vegas & Tonopah out, effectively killing it by denying access to UP shops in Las Vegas. It died and the Tonopah and Tidewater which ran from Ludlow (ATSF) to Beatty took over the BG to Goldfield. If I do move to a later date then a variety of new cars become possibilities. The roadbed of the LV&T became Highway 95 which I happen to drive every day to work. My layout is now essentially finished 🙂 Now it is about fine tuning and refinement. Time for some operations sessions, too.